MEEKER — Anyone applying for a building permit — residential or commercial — in the Town of Meeker will need to include energy conservation in his/her planning as of July 9. “It’s going to be a learning process,” Meeker Building Inspector Carl Padilla said. He has been meeting with local contractors to let them know the code is being adopted and give them a chance to research the new requirements. Designated historic buildings, buildings that do not contain a “conditioned” space, any building that does not have electric or fossil fuels providing comfort heating and any building that is “otherwise exempt” from the provisions of the energy code itself, are not subject to the energy code. Violations of the energy code are punishable by fines and/or jail time. The Water Street paving project is on hold due to a shortage of paving oils. If oil becomes available, the project will go ahead, said Public Works Superintendent Russell Overton. United Companies, the company contracted for the paving project contacted the town with the news of the deficit. Overton said the petroleum industry is using all available crude for gasoline and diesel, creating a shortage for road paving and patching projects. Meeker Chamber of Commerce Director Suzan Pelloni said the chamber-sponsored downtown events during Range Call were “very successful” this year. As of the end of June, the chamber Web site has received 19,787 “hits” or visits this year, the chamber office has fielded 1,812 calls and 1,165 walk-ins. Police Chief Bob Hervey addressed the board with a request from Holistic Health and Fitness in Craig to have off-duty officers assist with security at a cage fighting event at the Rio Blanco County Fairgrounds Saturday, July 12. According to Town Attorney Gerry Viscardi, the alcohol-free event is sanctioned and monitored by the Colorado Boxing Commission. Holistic Health will reimburse the town for the officers’ pay. “I think we’re going to be receiving more and more of these kinds of requests,” Hervey said. The trustees agreed to enter into an agreement with Holistic Health for the officers to work the event. n The board adopted a resolution opposing proposed severance tax initiative No. 113 coming before the state legislature. If passed, the initiative will reduce the amount of severance tax dollar distributed to local municipalities. n Awarded a bid to the Mason Company for kennel materials for the outdoor dog runs at the pound. A local bid failed to meet specifications. n The next board of trustees meeting will be held July 22 at 6 p.m. 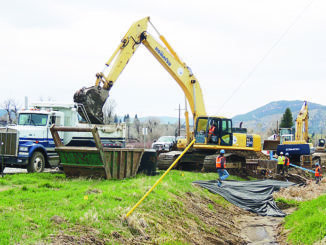 The project to extend water and sanitary utilities out to the new Pioneers Medical Center at Meeker Terrace, to the Curtis Creek area, and then out to County Rd 15, began on April 24.